This Article Has Been Shared 230 Times! Download Royale port to Win7 Aero Windows 7 theme. Looks like Windows XP Royale but can be used on Windows 7, Windows 8 Operating System. Windows 7 Theme Lion is a Mac looking Visual Style for Windows 7 PC. Windows 7 Theme Crystal Skin Pack is shiny Visual Style with a clean, crystal Windows 7 Desktop. Installer has a easy and safe install option to easily install. Windows 7 Theme Soft7 SE is the second Edition of the named theme. It is a soft, translucent visual style for Windows 7. You will love the theme. 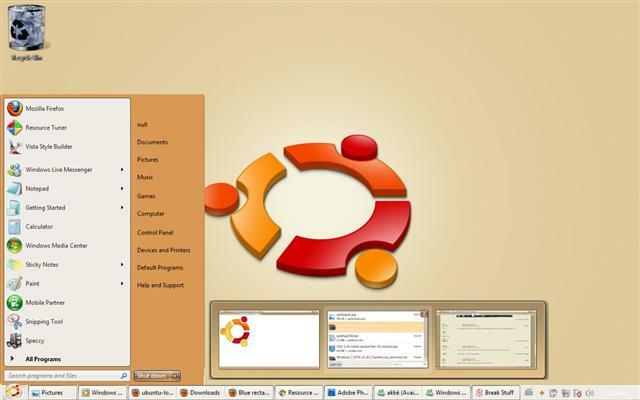 Cite this article as: Abhishek Ghosh, "Windows 7 ubuntu," in The Customize Windows, October 20, 2010, April 24, 2019, https://thecustomizewindows.com/2010/10/windows-7-ubuntu/.